Yesterday was all about Family and Football around here and with the exception on answering a phone call or two; I didn’t watch or read any media until the puppy bowl started. 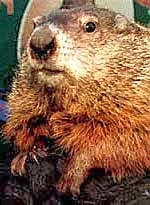 In the back of my mind I was wondering if Punxsutawney Phil had saw his shadow foretelling of another 6 weeks of winter. If you are like us and I’m betting you are- we are done with winter and need a sign, any sign that spring is on its way. So once I got the kids on the bus to school- 2 hours late mind you because of the forecasted sleet and snow we didn’t get, I decided to go on my fact finding mission. Sure enough, according to the Washington post, that silly northerner Phil had in fact saw his shadow yesterday. But, he was wrong last year remember? He said we would get spring early last year. Instead of leaving as soon as I read spring was another 6 weeks a way according to Phil, I decided to keep reading the whole article and there it was at the bottom- a beacon of hope for this southern lady. Seems there is a southern groundhog based out of Atlanta; General Beau Lee is his name and he has been predicting the comings and goings of spring for the Southeast for 33 years. How in the world did I not know about Beau? A quick click of my mouse and Hey! Beau says spring will come early for our region! And Birmingham Bill, (based out of Birmingham Alabama naturally) agrees with Beau. I like these southern groundhogs. This made me realize maybe you don’t know about your own regional groundhog either and you’d like too. After all, we don’t plant our gardens full of plants out of our growing and hardiness zones, so why should we listen to a groundhog out of our region? Here is the link to other groundhog prognosticators. Since there are parts of North America currently not covered by a groundhog, the folks at AccuWeather were kind enough to make us a spring weather map. I know this whole predicting of weather is a hard thing to do, so I'll take any signs of hope at this point. It's been such a cold, long winter, we are all ready for spring aren't we? I’m looking for signs of spring everywhere. And it may be just wishful thinking, but I swear I see the hint of change on the branches of our trees and a few sprigs of green wild onions coming up in the lawn. A special thanks Beau for giving me and all of Southerners much needed hope! 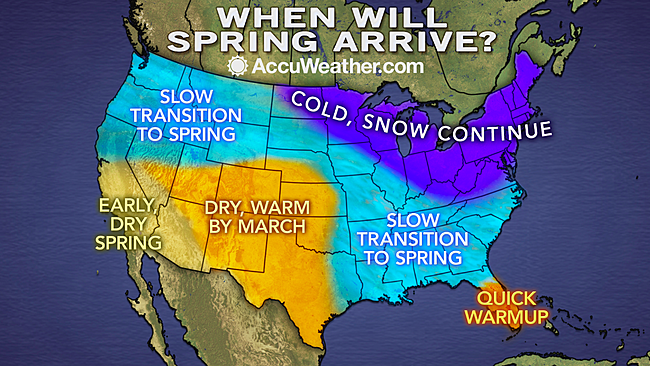 Please share in comments- do you see any signs of spring in your region? Where are you on the above map? I love seeing Hens and Chicks when I visit others gardens- I really should try planting some myself. I have my fingers crossed right along with you. Blah. I am SO SICK of this weather and I was REALLY hoping that spring would be right around the corner. Boo! I hear ya! I'm so tired of the cold and grey skies- I wish we would get some snow so we could play for a day. I feel sorry for all of you covered in snow and ice. I know it's so cold and hard to get around. I'm in Ontario, Canada and the other day I heard birds singing, which is uncommon during our winters. HOWEVER, we are getting 15 centimeters of snow today...I hope it's an early spring. Brrr, that is cold for your area. I love watching and listening to the birds but lately there's been no early morning visits to the feeders, it's just too cold. Sadly in Vermont we have a lot more winter to go. No sign of Spring here at all. We are smothered in snow. 12 inches! I am not happy about this weather! I am ready for spring. Wow- that is a lot of snow! At least you got to hear some birds before all that snow came. Yes, I bet you do have a lot of winter left, but I've heard the summers there make up for the winters. Ha! You must live in a cold part of North America. Sorry, you won't get spring soon either. Beau is a cutie and I am ever hopeful he is correct and spring gets here ahead of schedule. It's certainly not happening today. It's cold again-everywhere. I like your positive spin on the winter with no end. I'll keep your spirit in mind this summer too when its hot and humid. I bet the Arizona mountains are beautiful in any season. I'll hope for snow and no wildfires for you! Ha! I don't think Phil will. I took a peek at your blog and saw lots of pretty snow and deer so I know you are very ready for spring! Woah, that is a whole lot of snow! I wish we would get just a little bit here. Enough to bundle up and play in. I hear ya! We haven't got any snow to speak of but its been cold.